I was recently searching for some new salad recipes and came across this one, which I just had to try! 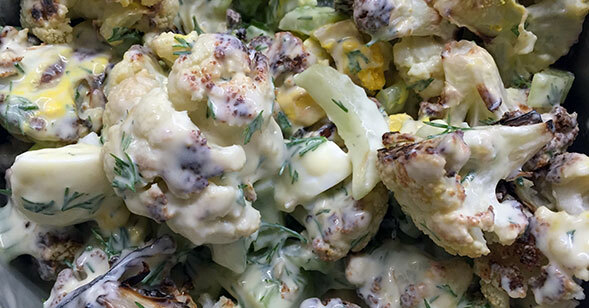 This recipe is a great healthy alternative to a creamy potato salad. I tried it and now it is something I make regularly as a side to some protein. It will be a great salad to take to BBQ’s, with the Australian summer just around the corner! Place cauliflower onto baking sheet and season with salt, pepper, and lightly spray canola oil over the top. In a large bowl, mix together the yoghurt, mustard, honey, dill, garlic and lemon juice . Then combine, in the same bowl, the onion, celery and eggs. Set aside. Once cauliflower is cooked, set aside and let cool slightly before adding to the bowl. Combine all ingredients together.